When you tally up the numbers, it’s a little crazy just how many Assassin’s Creed games that Ubisoft have managed to cram out since the franchise made its debut. Since 2007, there’s been the original trilogy, Brotherhood, Black Flag, Unity, Syndicate and Origins plus a plethora of mobile entries. Yet, despite that deluge of sequels and spinoffs, Assassin’s Creed: Odyssey manages to reinvent just enough of the formula to keep things interesting. Or, at least interesting enough. A rote and tepid plot holds it back from reaching the same heights as its most-immediate predecessor. 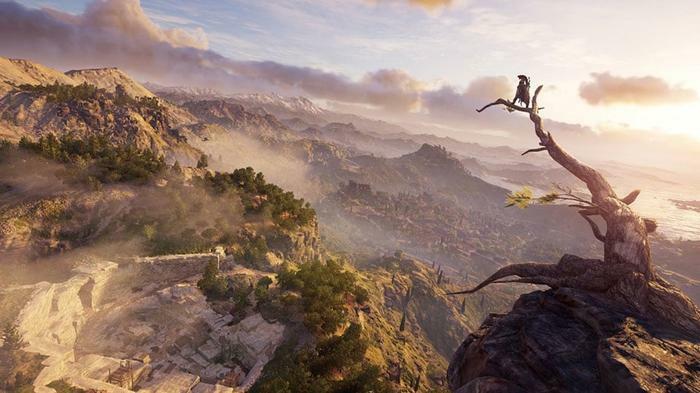 Still as far as modern AAA open world games go, Assassin's Creed: Odyssey cribs from the best and splices it with a sprawling and visually stunning world that’s more than just a backdrop to the action. Ubisoft’s pulpy visage of Greek myth and legend is a delight to traverse and easy to whittle away the hours within. Pretty much every Assassin's Creed plotline is about the same three thematic hooks: family, vengeance and freedom. In this respect, Odyssey is far from the exception. But the way that ideas are handled in Odyssey comes across as just a little bit more nuanced and well-executed. It’s not as much of remix as it is a reforging of what Ubisoft has done with the franchise before. 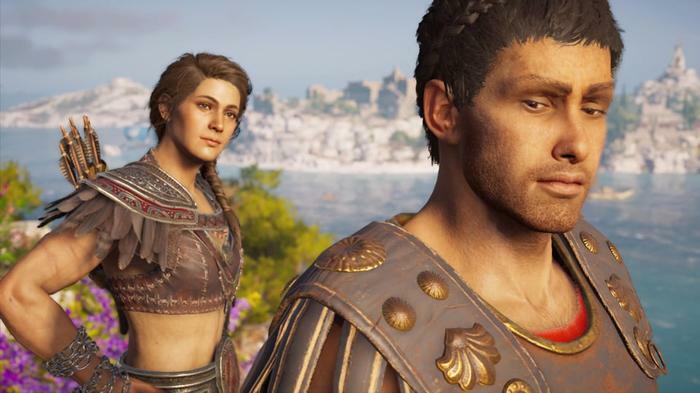 In Odyssey, you’re given the option of either playing as Alexios or Kassandra. Either way, you’re a mysthios - an orphaned mercenary who’s grown up on the remote island of Kefalonia. It’s the first time the series has really given the agency to choose the gender of the game’s protagonist and - aside from Black Flag - the first time the series has almost-entirely severed its connections to the larger mythology of Assassins and Templars. Sure, Odyssey will see you do all the same thing that you do in other Assassin's Creed games: climbing, sneaking, stealing, stabbing and diving headfirst into conveniently-located piles of hay. But neither Alexios nor Kassandra are Assassins. They’re just people with weapons who sneak into places they shouldn’t be and wage a shadow war against the sinister cabal that’s working behind-the-scenes plunged Greece into civil discord. Depending on your attachment to the franchise, this approach will or won’t work in Odyssey’s favor. Appropriate as it is given the setting, the Theseus Paradox comes to mind. It sometimes feels like there’s so little of the original series here that you have to ask the question: if you take the assassins out of Assassin’s Creed, what’s left? There are a few scattered modern day sequences and cutscenes that continue the story of Layla Hassan, the renegade archeologist introduced in the last game. However, they’re very brief and feel like they’re only really there for the niche-within-a-niche that really cares about the series’ connective narrative tissue and long-term trajectory. For better or worse, Ubisoft have put their chips on the historical narrative here to carry most of the dramatic weight and segregated the more-meta elements aside for dedicated fans willing to put in the hours it’ll take to fully unlock them. They’re treated like a bonus, which I found a bit frustrating. Sure, I’m that rare fan who actually the modern-day frame-narrative found in previous Assassin’s Creed games - and I do understand that this approach probably makes the most sense for the most amount of people. But it also leaves the Odyssey’s main narrative in a place that feels stretched out and half-baked, at times. Things are introduced, and never really resolved unless you go through the trouble of climbing every tower, opening every chest and tackling every bandit camp. The opening hours - and the larger cast of characters that are introduced in it - are full of energy and charisma. However, there’s a long middling stretch at the heart of Odyssey where it feels like little - if anything - really happens. Even as someone who enjoyed the rhythm of the grind, I found it a bit of a struggle to get to stick with the game long enough to see the credits. At (the best of) times, Assassin's Creed: Odyssey feels like a tastefully-crafted riff on the earlier Black Flag, The Witcher 3: Wild Hunt, World of Warcraft and Middle-Earth: Shadow of Mordor. You’re dropped into the game’s sprawling recreation of Ancient Greece and left to pick a direction. Regardless of which way you go, you’ll find a world full of question marks waiting to be discovered and side quests to be completed. There's also naval combat. Early on you're given a ship and crew, and will need to use it navigate and explore the archipelago in which the game is set. Like many things in Odyssey, this aspect of the experience has been carried over from previous games with minimal changes. As opposed to the icon gardening of previous games, Ubisoft emphasize and introduce a new style of play in Odyssey that they call Exploration Mode. Designed to incentivise discovery, Exploration Mode swaps out the usual rigamarole of accepting a quest and then walking to a map marker by instead giving you vague(ish) directions about where your objective is located. Rather than just run from A to B like you have in previous AC games, you’re forced to orientate yourself. Study the landscape and learn its landmarks. Explore, familiarize yourself with and navigate your environment. Even if the actual gameplay loop here isn’t really all that meaningfully different, Exploration Mode does a good job of making it feel different enough that I hope Ubisoft hold onto it going forward. Still, I can’t help but wish it went further. It would be nice if Ubisoft provided the same breadth of gameplay options found in stuff like the recent Pathfinder: Kingmaker or Invisible Inc. Give me more agency over the kind of Assassin's Creed experience I’m after. Let me turn off the procedural side-quests. Let me make the game less of a grind. Let me turn off combat and explore this visual feast of a world. Let me turn up the difficulty of combat and make it more realistic. If you’re going to give players options, give them options. By contrast, the new Mercenary and War systems prove less-satisfying inclusions. The former is essentially a riff on the popular nemesis system found in Middle Earth: Shadow of Mordor and last year’s Shadow of War. Be seen stealing, fighting or trespassing - and you’ll attract a bounty. The higher your bounty - the more mercenaries will come for you. Unfortunately, unlike its inspiration, the elite soldiers that’ll track you down from time to time are completely devoid of personality. Sometimes they’ll be given a fun name or a cool weapon, but they all may as well be the same faceless hunter-killer. Once you’ve fought one mercenary, you’ve pretty much fought them all. The entire system becomes an irritant when it could be so much more. Meanwhile, the War system allows you to - after you’ve completed the relevant side-objectives - aid either the Spartan or Athenian war effort by helping either player in the Peloponnesian conflict claim control the region. Sign up for a skirmish, and you’ll jump into a Dynasty Wars-style melee. Kill enough enemy soldiers and captains to make a difference and you’ll win the day. It’s not particularly fun, but it does net you some decent loot. The problem here is that - despite Odyssey being the first game to incorporate branching dialogue and player choice - the decision to side with either faction here comes across as almost entirely without meaning. Your allegiance will sway over the course of the story, so there’s no real impact or benefit to helping one faction dominate the other. Before long, it becomes just another mission type - and not even a particularly good one. 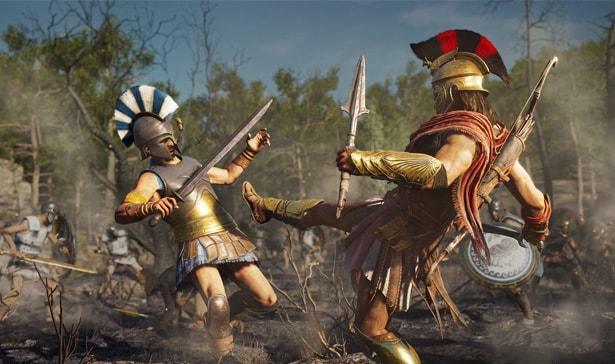 The other flaw here is that the combat in Assassin’s Creed: Odyssey just isn’t as good as it thinks it is. As with Origins, it plays out as a mix of The Witcher 3 and Destiny. Enemies appear, you slash at them, dodge or deflect incoming blows. Rinse, repeat - until you get new loot. When that happens, you grind down your existing gear into crafting materials and start the cycle over again. Even compared to its immediate predecessor (which played quite similarly), combat encounters in Odyssey feels frustratingly finicky and without adequate weight. At times, it almost feels like there’s a kind of input lag at work - I’d often hit the block key to no avail. It sometimes felt like the game’s systems were working against me and nabbing away any latent satisfaction that might come from mastering them. 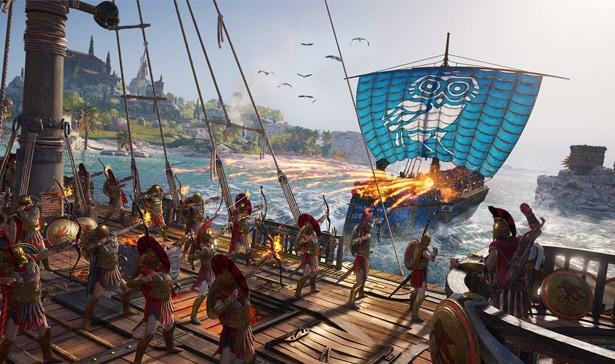 While previous installments have had plenty of meat on their bones, Assassin's Creed: Odyssey feels like one of the series’ most content-rich entries yet. However, not all of that is necessarily worth seeing. There’s the main quest stuff (which is fun but often contrived), the side-quest stuff (which is infrequently great but usually forgettable) and the procedurally-generated missions (which are entirely skippable). If you stick to the path, the entire adventure will probably clock in around forty hours. If you’re more prone to exploration, I could easily see you spending about fifty hours on it before you hit the credits. Meanwhile, sinking your teeth in and sucking every last drop out of Odyssey will probably take closer to sixty or even seventy hours. Even if a lot of that length feels padded by grind and travel-time, that’s still a lot of game to experience. In this sense, Odyssey lives up to its name. It’s an adventure of the scale that only a company like Ubisoft could realistically achieve and, at times, it feels like it might be a contender for one of the series’ best installments to date. Unfortunately, the moments between these moments are long, repetitive and uniform. Likewise, as visually gorgeous as the game’s world initially seems, it doesn’t take long for the seams to show and the game’s crisply-detailed forests and lavishly-rendered mountainsides to blend into one another. 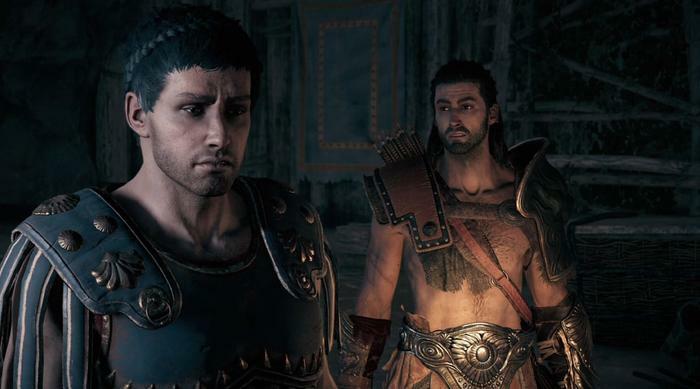 Origins did a great job of immersing you in the sense of community that defined its world, characters and narrative. Odyssey doesn’t pull off the same trick. Where the last game made you feel like an inhabitant of a world underpinned by personal-stakes, this one settles for making you feel like a cheap tourist. It’s not a bad game, by any means. But the things it does to move the franchises’ status-quo forward fail to offset the ways in which in which it falls short. It’s easy to list the ways in which Odyssey is a good Assassin's Creed game. It’s easier still to list the ways it could have been an all-time great one. 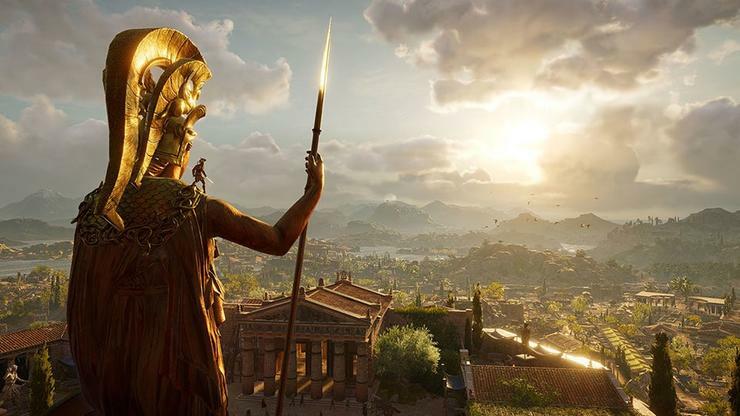 Assassin's Creed: Odyssey’s world and characters lack the heart found in Origins but if you’ve dropped off the series in recent years and are after an epic in the most classical sense of the word, it’s a trek worth taking.